Olio extra vergine Baldaccini Lucca 0.5 l - dapasquale-luccas Webseite! In Villa Baldaccini we produce extravergin oliveoil d.o.p., that won for two years the “five drops”, the highest price for lucchesian oliveoil recognized by the Italian association of sommeliers and oiltasters. In November our guests can take part at the harvest of olives and assist to the oilpressing in the oilmill; at the end of the exhausting openair day a wonderful rustico meal will wait for workers ,obviously prepared with fresh squeezed oil! In the Lucca plain, the olive tree gives colour to the landscape and supplies an incomparable oil that is exported all over the world. Its organoleptic characteristics have elevated it to being the principal nutriment in a healthy and correct diet. This oil is unique, thanks to the perfection of its taste (the yield of olives at the right point of maturation, an intense sensation of sweetness with a hint of spiciness), colour (golden yellow with green reflections), and overall aroma, to the point that many tasters keep a sample of extra-virgin oil from the hills of Lucca as a term of comparison. 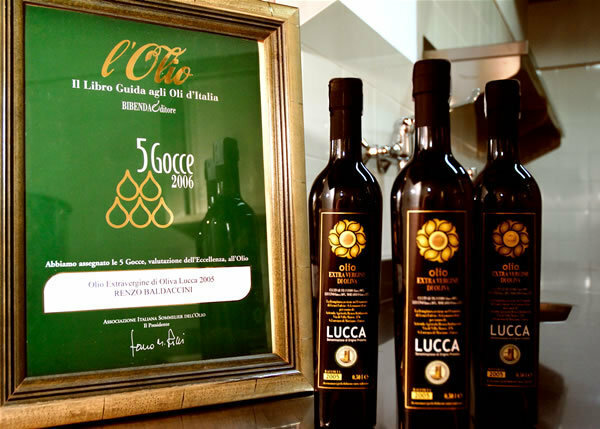 This product is so famous throughout the world that the Oxford Dictionary defines it as “Lucca Oil: superior quality of olive oil” comparing it, inique oil in the world, to other world well known products such as cognac and champagne.